Soft beams of light seeped in through the frosted glass, like water dripping from a corporation-tap. Reflecting on the milky-white tiles of the bathroom, the light strayed about the four congested walls in infinite loops of Brownian motion, making the bathroom fittings seem gothic in a bohemian glow. He wasn’t sure whether it was Brownian motion or not; physics was his Achilles ’ heel – precisely why the physics professor at the IIT coaching class chucked him out, four years ago. He smiled at the thought – he had come a long way since then. Sujoy’s voice echoed – floating through the psychedelic notes of Floyd. Being a virgin, he couldn’t be sure – but if his more experienced friends were to be trusted, yes it is. The songs did something to men (and women), or, why else would two (perfectly heterosexual) friends light up in their toilets? Why else would he, of all people, decide to light up, at all? It all started when he first caught his dad in the act. He was a toddler, back then and thought his father was doing some magic trick by ‘eating fire’. Confident of repeating his dad’s amazing feat – he tried ‘eating’ a rolled-up newspaper with the other end on fire. He didn’t get himself singed thanks to a vigilant mom who went on to counsel her child, rather unparliamentarily. At the end of a passionate ‘one to one’ – the child emerged with tears in his eyes, countless cane-marks on his thighs and a hatred for the ‘tiny burning cylinder’. As he grew up, he learned how deadly ‘the burning cylinder’ was and realized how badly his father was addicted to it. The last thing he wanted was to lose his father to gruesome mouth/blood cancer . He even devised an ingenious way to force his father into kicking the habit. The very next day, his mom scampered onto the terrace, having heard his father breaking into a vicious coughing spree. He smugly looked on as his mom rubbed his teary-eyed father’s back; tobacco when ingested with chilli powder gives interesting results, indeed. From then on, his dad made it a point not to leave his Wills packets unattended. Time sailed on, and life changed for the smartass pre-teen who now grew into a young man caught in a time-warp. Life just wasn’t happy-go-lucky any more. He flunked life’s tests, the same way he flunked despicably in exam. By the time he was 21, he had gotten himself beaten-up, was abandoned, lost his lady love and had gotten himself killed nearly-twice. Yet – he stayed himself clear of the ‘sutta’, which now even had a tribute-song of the same name to boot, all set to lure him. At the end of the day, Pink Floyd won, where ‘Zeest – the band’ lost. Lip service from Sujoy didn’t hurt. There’s just one life (Sujoy was Christian and didn’t subscribe to rebirth) – why waste it depriving oneself of the many pleasures and possibilities it offers? Some pleasures may slow down life’s timer, but old-age is pain. Be a man. Die in pleasure. Die happy. Die young. He felt his body shiver as realization drove deep in. He had been through enough already. He had successfully repelled plenty of the worldly-vices (but fell prey to many others). Yet, life double-crossed him. Now the ball was in his court. His arms trembled – he even felt the world around him vibrate in resonance. Heck, he could even hear a buzz that grew louder in intensity with time – must be the resonance in action, he thought. The vein on his forehead twitched. Rivulets of sweat soiled his shirt. He stretched open his right arm (which was now trembling flailing incessantly). Revealing one of his classy smiles reserved for special occasions, Sujoy gingerly placed the Davidoff on our dude’s palm. He had played the role of Chandrasekhar Azad in a school tableau – where he aimed a (fake) revolver at a group of attacking police officers. The cigarette was the sole bullet in our Azad’s revolver – and a white ‘pot’ of cops silently returned the stare. Back then, the ten-second tableaux won him the first place, but that day, he ‘enacted’ the scene for good ten-minutes. Then, like Azad, he drove his ‘bullet’ into his head. A concerned Sujoy, forced the door open to see the newly-christened Azad gaze blankly back – donning an unlit cigarette between his lips. Sujoy flashed his ‘classy smile’ the second time, that day. Soon, Sujoy’s Nokia 5130 Xpressmusic acquired position beside the shaving mirror – duly playing ‘High Hopes’ from Floyd. He shoved a bucket aside and sat on a chair brought from the dining room, while his friend made himself comfortable on the toilet seat. Sujoy conjured a lighter from nowhere and flicked it. The reddish-orange flame swayed like a belly dancer on trip. “Let’s light up together, shall we?” Sujoy winked. Our friend bent down with Sujoy, aiming his cigarette to the flame. “Carefully man, A forest fire’s the last thing I want,” Sujoy took a dig his friend’s perennially-unkempt hair. Our man barely noticed the snide comment. His eyes were transfixed at the tip of his cigarette – which now made contact with the flame. The edge of the cigarette smouldered in an eerie glow. Tobacco and nicotine burned. A moment late to notice Sujoy withdraw his lit cigarette, our friend pulled his head back. He looked up at Sujay, who seemed to be sucking the cigarette like a kid enjoying his frooti. A couple of seconds later, he withdrew the cigarette from his mouth and blew out a long trail of smoke. Having inhaled some of the smoke, he coughed badly – he loathed the very smell of cigarette smoke – it always made him cough. He wondered how it would be when he had the real thing. Now our dude nearly had a heart-attack – he was so sure he had one, cause he hadn’t seen his heart beat this fast till date. Nevertheless, he mustered all courage, and took a deep drag at the cigarette, closing his eyes, half expecting himself to collapse due to a long bout of coughs. Having trapped the ‘smoke’ inside him, he opened his eyes. “Now, inhale,” our friend followed Sujoy’s instructions and took a deep breath. He was so sure he’d cough away for the rest of the day, just because of this single drag. Turns out that he didn’t. As he inhaled, he felt something happen to him – a peculiar sensation took hold of his head. It wasn’t a bad feeling. On the contrary, he felt real good – a ‘ring of pleasure’ formed around his forehead, around his eyebrows. He felt slightly dizzy and elated. Our buddy had the first ‘high’ of his life. “Dude, you’re a bag of surprises – I expected you to lay writhing on the floor. But, look at you right on the first drag itself! Awesome man! ‘High’-five,” the Barney fan in Sujoy lifted his left palm, but never got the return five. Meanwhile our friend took another drag. And another. And another. As soon as this cigarette got over, he lit up another one. He went on to smoke six cigarettes in a row, until he felt like vomiting – he felt as if some virus had infected his entire system, starting from his throat. He stood up, only to find that he couldn’t balance himself properly – he felt so ‘high’ that he thought his head hit the ceiling, only to realize the pointlessness of that PJ he just made up and smile involuntarily. The sick feeling was at its peak, as he dumped his sixth cigarette into the closet. He thought he’d vomit any moment – smoking was indeed a bad idea. The high felt good, but the ‘hangover’ wasn’t quite appealing. He drunk six glasses of water, and had his second breakfast for the day from Sujoy’s place. Only then did the tendency to puke pass. As he bade good bye to Sujoy, he renewed his pact – he wouldn’t touch another cigarette for the rest of his life. Ever. The protagonist of this story died of lung cancer, thirty six years later. He was a chain smoker, known to smoke at least three packets a day. He’s survived today by his wife and two children. The man spent the last few years of his life in deep agony. Yet, he regularly used to sneak away for a secret puff. 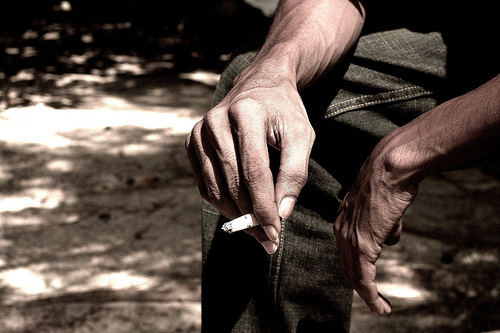 “I won’t touch another cigarette,ever,” he promised to his wife moments before he passed away. The staff nurse found two packets of cigarettes and a lighter from the man’s clothes, later that day. I'm CC'ing the model, this time. At least the photo was taken using the model's camera. 😛 Hehe.